Ok, I apologize for getting off topic in my last post but that is where I was led. I guess you can tell I’m just a little passionate about the cause of Zion. So here in part two I will continue what happened on Sunday. Back in Sunday School. We talked briefly about Numbers 11:29 where Moses wished that all of God’s people were prophets. The teacher asked what that meant and I commented that we should all have a personal relationship with God. We should have a direct line of communication with God so that we don’t need other people to receive revelation on our behalf. After other comments our teacher tied this into have the Lord’s Words written on our hearts. We were then asked to list what behaviors people who have the Lord’s word written on their hearts would have. I raised my hand first and commented. I referenced a scripture that had been read earlier. I said that the Law of Moses was a like a written list of things to do. Every action spelled out. But the gospel is more fluid and is meant to be internalized not dictated by an external rule book. It is to be written on our hearts. The teacher just pointed to the chalkboard where she had previously written “on our hearts” and then said we need to be a little more specific. Now it was probably my fault, I’m not the best wit words, written or spoken. But the point I was trying to make is that a people that have the word of the Lord written on their hearts will not have checklists, they will not have rule books, they wont have lists of do’s and dont’s. So we them proceeded to make a list. I’ll let you guess which one I added to the list. Here’s some comments on some of the above topics. This isn’tt what we discussed in class, just my own commenst for this post. Share With Neighbors – I think God’s people would not just share with neighbors but they would live the Law of Consecration. Everything you own is consecrated to the Lord. Then is given shared freely among the people in your branch of the United Order. Love One Another – This is one of the two great commandments. Love you neighbor as yourself. Selective Media – I don’t think this would even be an issue for God’s people. God’s people would have long ago eliminated degrading media from their presence. But probably not only degrading media but distracting media. Can you imagine people in their homes in the City of Zion choosing what they want to watch on their Dish Network? Hmmm. Real Housewives of Nauvoo, or General Authority Apprentice. Keep the Sabbath Day Holy – Again Not much to say here, other than I think God’s people would keep the Sabbath day holy differently than we do now. We depend upon lists of acceptable Sabbath day activities, including watching football, trolling the internet for interesting things, and serving our own needs and wants rather than the Lord. Ok, I’ll admit the football one doesn’t apply to me, but the others do. Live With Integrity – Comments in the class interpreted this to mean not being afraid to stand up for what you believe. Do we do this, yet deny others the same privilege? Do we condemn others as apostate when they are simply living by what the Lord has commanded? Dress Modestly – This come mainly from our traditions today. There is not commandment to dress modestly in the scriptures. Also modesty is a condition of our culture. On the island of Fais it is modest for young children to be naked. And then once they start getting pubic hair they ask their tribal leader permission to wear clothes. These clothes consist of a sort of lava-lava which covers their lower half. Men and women go around bare chested. That is modest for them. Is their modesty not real modesty because they live on some tiny island in the Pacific? Are they really immodest but just aren’t civilized enough to know it? I think it is very arrogant and prideful to assume that our standard of dress is the only acceptable standard of modesty. A person should choose whatever they want to wear or not wear. It is between them and God. God does not look upon our outward appearance, but upon our hearts. I think God’s people would be more concerned about removing evil tendencies from their hearts, rather than if a women is showing her belly button or a little cleavage. Don’t Wait to be Commanded – God does not want a people who have to be commanded in every little thing. God does not want a people who have to live the Law of Moses. God wants a people who act for themselves. A people who see what should be done and then do it. The President of the Church will never tell us to live the Law of Consecration; he will never restore Plural Marriage; he will never tell us to return to Jackson County. If we are waiting for a command from the President of the Church to do these things, IT WILL NEVER COME. We must take it upon ourselves to live those things God has told us are true. I personally cannot wait to get out of Podunk, Idaho and move to Nauvoo, Zarahemla, Voree, Far West, or some other Stake of Zion. I don’t leave because the way has not yet been prepared(D&C 133:15). But someday soon, the time will come. And I wont be waiting for a General Authority to tell me to go. Another thing I thought was interesting that, while the church condemns all use of alcohol(which use is permitted in Section 89), all the ward budget is buying for our Christmas dinner is turkey, pork, and rolls. With Section 89 stating that meat should be used sparingly, and a Church obsessed with the “Word of Wisdom,” I would think the ward would buy veggies and fruits. Anyway our lesson started and after reading the first paragraph from the manual our teacher asked us for comments. I was the first to comment. And, looking to nip some apostasy in the bud, I said that the Gifts of the Spirit come not form learning, education, or practice; but they come miraculously from the Spirit. Our teacher talked about why not everyone has certain the Gifts of the Spirit. He claimed that it is because not everyone needs certain Gifts. It was his teaching that the Gifts you are given were based on what needs you have. So once you become a parent you needs certain gifts. One you become President of the Church you need certain gifts(not his words). Now I don’t know if that really how they work. There seem to be many cases that, that is how they work. Well, as I typed I came across a scripture that seems to kind of support this view. Ok so this says that the Gifts are divided according to the Spirit’s will. And I do agree with that. But it’s not necessarily according to our need. But anyway, I’m inclined to think that there are some Gifts we are naturally prone to have when the Spirit comes upon us. People that are a certain way will naturally have a certain Gift. But anyway it doesn’t really matter. Moving on. In reference to Interpretation of Tongues, one brother said that he had tried to learn Spanish in high school and it was really difficult for him. But when he was in the MTC and had to learn Chinese suddenly he could learn a foreign language easier. I was going to talk a bit more about the Gift of Tongues but it turned out to be too long so I’ll save it for another post. Let’s just say the Gift of Tongues does not come with learning or practice. The Gift of Tongues does not help you learn a language or speak. After all once you know a language, how can it be a Spiritual Gift to speak in that language? Our teacher go quite passionate(meaning crying) about the next gift. The Gift of Translation I do consider this a gift even though it isn’t mentioned in “the lists.” We regularly sustain the leaders of the Church as Prophets, Seers, and Revelators. Yet Doctrine and Covenants 107:92 says that the President of the Church is to be a “seer, a revelator, a translator, and a prophet.” The gift of translation is to be one of the Gifts that a person should have to be the President of the Church. Now that I think about it its no wonder we haven’t received that brass plates, or the greater things; we don’t even sustain anyone as a translator. Not that sustaining a person gives them those gifts. But if for over 160 years no one in Church leadership can rightly be called a translator how can we expect them to come to us. Of course the Kinderhook Plates and the Greek Psaltry are seen as interesting incidents in the history of Joseph Smith’s Gift of Translation. Hopefully I’ll be able to talk about those more. But while the Brighamites lost the gift of Translation, the Strangites had a translator. Brigham Young did not translate and ancient records. It was James Strang that manifested all four Gifts of the President of the Church. In regard to the Gift of Translation, he translated the Record of Rajah Manchou of Vorito. This record was recovered from beneath a tree. He also translated the Book of the Law of the Lord from the Brass Plates. So while Brigham Young’s followers have been waiting 160+ years for the Brass Plates, the Strangites have already had part of it for about that same length of time. Back to our teacher. Apparently our teacher work in the field of Family Counciling or something like that. He said(nearly in tears) there have been numerous times when he was in a home and the teenage kids say something to the parents. He couldn’t understand what the teenagers said yet the parents seems to easily be able to understand them. This the Gift of tongues, interpretation of tongues, and translation are gifts that parents regularly have. They are needed to help understand children. Now I mean no disrespect to this brother. I respect his view of these gifts even though I believe they are wrong. Obviously by his reaction this has some special significance to him and I don’t want to disrespect that. And of course all this is just my opinion. We also talked about the Gift of Knowledge. This of course turned into helping us learn what we need at school. But towards the end I commented and said that, the gift of knowledge doesn’t come through school or study. It comes miraculously. The only one who gives us the knowledge is God. I used an example. When I was just a baby, my mother was laying carpet with my grandfather. She suddenly received the knowledge that I was in trouble. When she saw me I was just about to stick an electrical cord in my mouth. She didn’t learn or educate herself to know that I was about to do that. That knowledge came only by God. About the Gift of Prophecy one brother spoke up and said a revelation will never contradict a previous revelation. As I was thinking about this I realized that I found a loophole. I knew it before but never saw it as a loophole. We can know a true revelation because it will never contradict a previous one. So with all the modern policies and everything that contradict previous revelations why are we not decrying them as a church? Why do we embrace policies that blatantly contradict scripture? Because they aren’t based on revelation. They are simple policy changes. And there is the loophole. While revelations can’t contradict; there is nothing that says a modern policy can’t contradict a previous revelation. But of course, in order to use this loophole, you must first admit that modern policies ARE NOT based on revelation. In doing so, you permit people like me to openly reject those policies because they are not, in fact, based on revelation. But wait, that would cause chaos! People running around doing whatever they think te Spirit tells them. Gasp! We can’t have that, now can we. So obviously modern policies must be based on revelation. Oh, but than there’s that nasty fact that a modern revelation cannot contradict a previous revelation. So if modern policy is based on revelation, then in cases where it contradicts previous revelation, people like me are still free to reject those policies. Sorry but either way you look at it WE ARE NOT BOUND TO OBEY POLICIES THAT CONTRADICT PREVIOUS REVELATIONS! IT DOESN’T MATTER IF THE CHURCH LEADERS SAY THE POLICIES ARE INSPIRED! To conclude our meeting, the teacher asked why not everyone has all the Gifts of the Spirit. I commented that it is so that we will gather together and benefit from the gifts that others have. So when we meet together on Sundays why does nobody exhibit these gifts? Why do we not benefit from these gifts? Instead we sit there, eat a few crumbs of bread, take a sip of water, and listen prepared talks. Interesting post. After reading through it, I find myself curious why you attend church at all. I’m not suggesting that you don’t, but in your writings I don’t see any benefit that you receive from going, nor do I see how you are actually benefitting others (although I do believe they would benefit from you if they would seriously consider what you are saying). It feels like you’re waiting for something to happen, but I can assure you the only thing that is going to happen is that they will eventually disfellowship you or excommunicate you. From your own writings, you have referred to prophecy that suggests the gospel will be taken from the church and given to another (I think I’m close on the paraphrase). So…what keeps you in a church that is dead when measured against classic Mormon theology? On another note…you’ve hit a hot button with me! Section 89 is very clear when it comes to meat. It “should not be used, only in times of winter, or of cold, or famine.” In other words, NO hamburgers, etc. in the summer! So, the next church BBQ you have, ask your bishop why the church doesn’t produce wine for the sacrament, while he’s wolfing down his steak! Actually since the 1959 edition of the D&C that verse has contained an extra comma that was never there before (and its inclusion actually contradicts section 49 wherein the Lord states that the use of meat is ordained from man). Re-read 89:11 without that comma and it says, “should not be used only in times of winter, or of cold, or famine.” This places it in line with everything else mentioned in the WoW that should be a staple, moderate part of our diets. Just as man cannot live by bread alone, he can’t live by meat alone either. Unfortunately the person who told me this story also gave the most ridiculous excuse as to why that mistake has not been corrected. To claim that it would “give the antis more ammo to use against us,” is pathetic since the church gives out enough “ammo” already. This is just another incident wherein the leadership will fail to correct a problem because it simply refuses to acknowledge that the problem exists. David…great information. Since the original is still available, you would think that it wouldn’t need “correcting”! I am baffled that the original D&C, B of M, etc. aren’t being used today. Pretty soon, it will be “we believe the Book of Mormon is the Word of God, as far as it is translated correctly”! ‘course I also have to thank zo-ma-rah for an earlier post that talked about Heber J. Grant removing the Lectures of Faith from the D&C, so I simply bought a copy and now keep it grouped together with my scriptures along with a full copy of the JST. 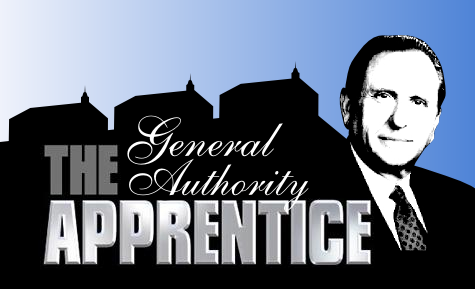 General Authority Apprentice! LOL!! Great promo pic, BTW. Another comment that came to mind falls in line with the statement of how we’re not bound to obey church policies that contradict previous revelations: One of the things that helped me with my awakening to the current situation is when the Lord tells us in the D&C that we’re justified in obeying the laws of the land that are constitutional. That brought the question to mind of, “Does that mean we’re also justified in not obeying laws that are unconstitutional?” I’ve been searching for that answer since. The “inspiration vs. revelation” debate also applies to the U.S. Constitution in general since we do believe it to be an inspired document vs. something that came via revelation since it does contain numerous imperfections and certain Amendments have both made it better and worse over time.